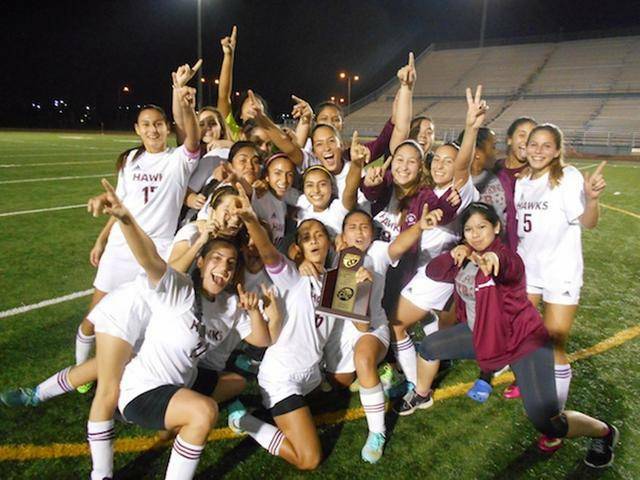 The Miami Springs Girls Soccer team came home with another win, making them district champions three times in a row! Their record this season is impressive with a total of 19 wins, 3 losses, and 2 tied games. Springs played Terra High School at Traz Powell Stadium on January 15, 2015 and defeated them 3-0 with Sophia Gomez scoring the first goal and Sofia de la Puente putting in two more. Springs celebrated the victory with their traditional bus parade around the circle. Their win that night brought them to the Regional Quarter finals, winning that game 5-0 against South Broward, Alyssa Deno scored three goals making a hat trick. (In sports lingo, a hat trick is when a player makes an achievement based on threes). The girls then moved onto Regional Semi-Finals against Pines Charter High School and were tied 1-1 most of the game, thinking that they would have to go into penalty kicks,until a shot was scored by Pines at the last minute. As the season ended here for the girls, it made them very emotional. Maria Salas, Senior at MSSH, shared “I think we should’ve had that game. We definitely played a much better game than they did, but in the end a few mistakes cost us our season”. As to their supporters, the girls played an outstanding season and we couldn’t be more proud of them. On February 3, Miami Springs Senior High Girls soccer team were invited by Rebecca Sosa to the Commissioners meeting to be honored on winning Districts several times. A huge shock came to the team when they were granted their very own official Miami Springs Girls Soccer Day.